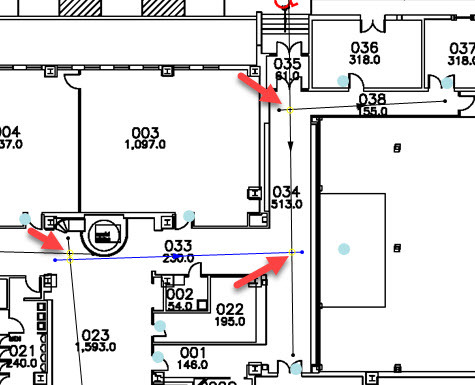 Click on Wayfinding and click Edit Locations. Then select Create Path. Draw the path by clicking on the beginning location. Click again to make a segment. Continue until you have the path you want. The path does not have to include the location points; it will detect the points as long as it is near the location. Note: If you make a mistake, hold down the control key (or CTRL) and click on the segment you want to remove. Continue creating paths. With multiple paths, ensure that any paths that intersect actually cross each other. You can see if the paths cross by viewing the intersections. There should be a faint yellow circle at each intersection. Wayfinding will not work correctly if the paths do not cross. If you need to remove a path, click on the path and select Delete Path. To ensure that the paths were created properly, you can test the route. Click on the destination point and click Test Route. A green dotted line should show the shortest route from the You Are Here point to the selected destination.